On the eve of his new tour with longtime pal and fellow guitar extraordinaire Steve Miller, Peter Frampton spoke with Epiphone about growing up in Bromley, Kent, playing Buddy Holly songs during lunch with classmate David Bowie at Bromley Technical High School where Frampton's father was head of the Art Department, the amazing story of his legendary "Phoenix" Les Paul, and buying his beloved Epiphone Texan. 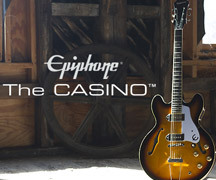 FREE Epiphone Deluxe Strap Offer! Throughout April 2018, buy any new Epiphone electric bass guitar (including Toby Basses) from any participating Authorized Epiphone Retailer and receive a FREE Epiphone Deluxe Leather Strap! For over two decades, Epiphone has earned a sterling reputation among the world's top guitarists and bassists for making affordable custom signature instruments that meet or often exceed the sound and feel of artist's prized vintage models. Throughout April 2018, Epiphone is offering fans a chance to win a new Epiphone Ltd. Ed. Matt Heafy "SnØfall" Les Paul Outfit! A winner from the U.S., Canada, and the UK/EU will be chosen on May 1, 2018. Every March, Epiphone celebrates the anniversary of Mr. Les Paul's first masterpiece, "The Log"--a solid body guitar that he built from Epiphone and Gibson guitar parts at the Epiphone factory in New York City in 1940. To a younger generation, The Log looks more like a piece of folk art than a revolutionary instrument. Since 1931, the Epiphone Masterbilt Collection has been the "House of Stathopoulo's" premier line of acoustic/electric guitars. Today, they are recognized around the world by both collectors and contemporary players for their beautiful sound and classic design. The Masterbilt Collection was founder Epi Stathopoulo's first major endeavor since inheriting the company from his father, Anastasios, that was all his own. And it was a risk, too. FREE Shadow® Sonic Soundhole Tuner Offer! Throughout March 2018 Epiphone is offering fans a FREE Shadow® Sonic Soundhole Tuner with the purchase of select Epiphone acoustic guitars. Buy one of the following Epiphone acoustic guitars from any participating Authorized Epiphone Retailer during the month of March 2018. This spring Judas Priest will be back on the road featuring Epiphone Signature artist Richie Faulkner and his new Ltd. Ed. Richie Faulkner Flying-V Custom. Judas Priest will kick off a world tour in support of their new album, Firepower, on March 13 in Wilkes-Barre, Pennsylvania with support from Black Star Riders featuring Epi fan Damon Johnson. The album will be available on March 9.